Bubbles, the whale, swam deep under the water. He swam past fish and coral, jellyfish and octopus, sharks and tuna. Once in a while Bubbles would swim up to the surface and blow his spout high into the air. That's what whales do. A huge storm roared across the sea, churning the waves higher and higher. At first Bubbles didn't like it, but then he found that if he rode on the waves, he could go up and then down and then up and then down and he thought that was a lot of fun. The storm got much worse and soon the waves were so high that they crashed down on Bubbles and nearly drowned him. “I don't like this anymore,” Bubbles said. He swam down under the waves. Even then the storm made the water wavy and choppy and he felt sick. Soon he didn't recognize anything. “I don't see any sharks. I can't see the coral and the jellyfish. I think I'm lost!” All day and all night the storm raged. Poor Bubbles had to stay down deep, so that he wouldn't get tossed about. “I want to go home. Which way is it?” Bubbles blew his spout and water flew all over the man. 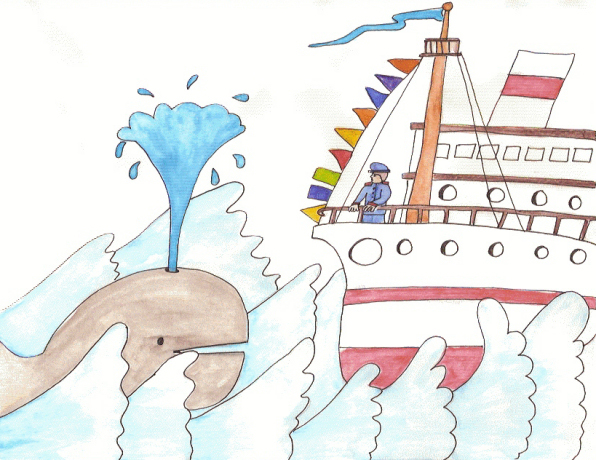 The ship's captain laughed and wiped the water off his face. “Follow me,” he said.